Ryan Bingham, a renowned singer-songwriter based in Los Angeles, got his “big break” by co-writing the theme song “The Weary Kind” for the 2009 acclaimed film ‘Crazy Heart.’ Now, he’s on tour across the U.S. performing his newest work, ‘American Love Song.’ We sat down with him this week to talk about the record, his songwriting process, and what his music means to him. How does ‘American Love Song’ differ from your previous projects/records? I’d say it’s a lot more on the blues side than my previous records. I definitely set out to make more of a blues record than anything. What was your musical process for writing this album? Can you describe your emotional journey with it? You know, I always tend to need a bit of solitude to write songs. I wrote some at home, some on the road, and some at a friend’s place in New Mexico out in the middle of nowhere. I need to find some place where I can get away from distractions. You know, I definitely draw off of all my experiences, kind of past and present- it’s all a part of it. If the songs aren’t making me feel something while I’m writing... I try to feel those emotions first, I think that’s pretty important. Do you typically write lyrics first or instrumentals? Was that the case with this particular record? Usually the music always comes first- yes definitely. Can you describe your process for choosing lyrics to fit the instrumentals? The music just really sets the tone for whatever emotion is going to come. There are definitely notes and chords that are lighter and darker than others, so the tempo and then the key of the song sets the tone for what’s to follow. This album has a lot of political references and even touches on border politics. What, in your words, is this album truly about? Well there’s a lot of layers to it, a lot of stuff that I’ve experienced growing up as a kid, moving around the country. A lot of it ties into social issues and what not. I wouldn’t necessarily call it a political album, but it’s consciously aware, which I try to do when I write. I’m just a person like everyone else who’s influenced by the world around him. A lot of your music touches on your childhood and life experiences. What role would you say music has played in helping you get through hard times? Writing songs has always been a kind of therapy for me. Sometimes things are difficult to express or talk about. Writing music and playing guitar has always been an outlet. Now, you find folks that you have common experiences with, and it’s gratifying to share that stuff with people and hear stories about how maybe a song helped someone get through something similar. Tying your new album ‘American Love Story’ in here, what did you portray through this album? You know I think at the end of the day, the album is pretty layered, it’s very autobiographical, very personal, but it’s kind of my take on the world around me and how I’ve been influenced by current events. I’m not necessarily sure if that was the goal. I’m always going to write songs about things that I’ve experienced, and the past few years I’ve traveled around the country and met people, and now I’m telling stories about that and sharing experiences with people. Do you have a song, written or not written by yourself, that you’d say you identify with the most? I do, there’s a Bob Dylan song called a “A Hard Rain’s A-Gonna Fall” that I heard when I was very young that I very much identified with. You don’t hear that kind of song on the radio. What, in your mind, makes an album cohesive? How do you know when it’s complete? I don’t know, sometimes it never does feel complete. I guess the narrative of the album, you kind of revolve around the center of that. You know the album is complete when you have 12-13 songs and you don’t want to take them off the record. Who are you speaking to in ‘American Love Song’? It’s really just anybody who wants to listen and enjoys the music. I try to take everybody into consideration when writing these songs, and everybody’s feelings and emotions are reflections of my own. If there’s some young kid in a small town looking for music that has a different message than they’re portraying in the pop commercial world, then maybe that’s a good thing. You’ve won a number of awards, including a Grammy. After such an accomplishment, where do you hope to see your music career take you in the next few years? Oh, you know, I just feel very lucky to have the opportunity to get out on the road and play for people. It’s never really been about winning awards or accomplishing a sense of, I don’t know… my interpretation of success is being out here and being able to do it and people want to hear the songs. I feel like I’ve already ‘made it’ in so many ways, [that] I don’t know if it could get any better. 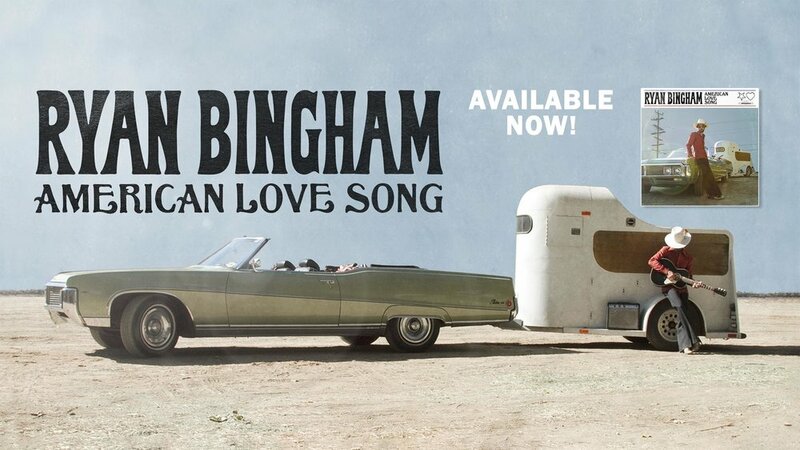 Catch Ryan Bingham at Denver’s Ogden Theatre this Tuesday, April 2nd. Grab tickets at this link. Keep up with Ryan here.